Sitting on the floor of the 2000 Los Angeles Auto Show was Saturn’s very first concept car—a rational, promising future that reality stood no chance of living up to. It was a new millennium. Y2K was a close call, but we made it to the 21st Century with wide-eyes, big ideas, and hearts full of hope for a rational, practical car of the future. 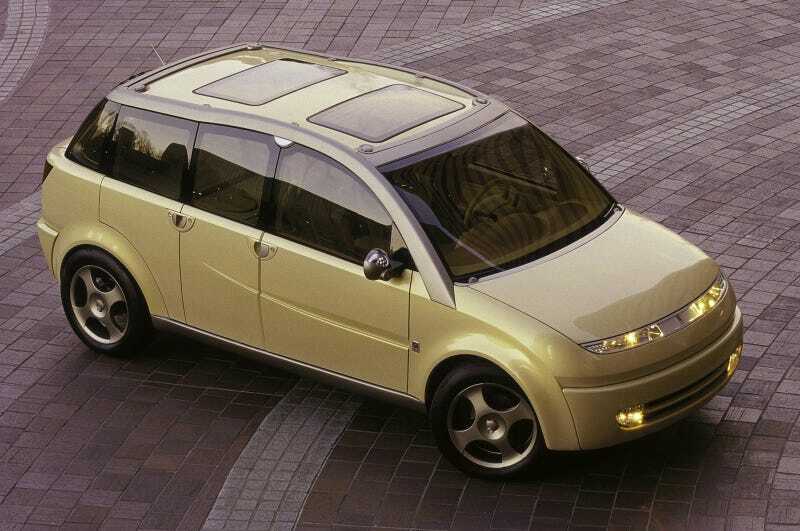 That car was the Saturn CV1 (Concept Vehicle 1). Color-coordinated engine compartment! Look at that—a resource manual with color-coded guides to all of your engine’s fluids and vitals, right there under the hood! This is not sarcasm! This is that much better than cryptic symbols and a drab 3,000 page owner’s manual. Rear-facing fold down seats! 5+2 seating! At least I think that’s what those strips of fabric are emanating from the back of the front seats. It looks like there are seat-belt straps that meet in the shape of an X like a 4-point harness. All seats besides the driver’s could fold flat for maximum capacity. Split rear tailgate isn’t anything new, but it’s still rare and awesome. Judging by the little switch by the steering-wheel, it appears the CV1 had keyless start of some sort. Or a really cool dial-like key. That trash-can shaped plastic tube in the dash is actually a set of enclosed adjustable shelves. Uh.. easy-to-clean hard plastic surfaces? George – he is 55, runs an exotic pet store and enjoys playing golf and restoring vintage motorcycles. With their three children grown, he and his wife have moved into a loft above their business. Liz – she is 42, a top-producing real estate agent with an active social/business networking life. Divorced with joint custody of two children aged 8 and 13, she enjoys gardening, art and computers. Staci – she is 33, a housewife with two young children. She sometimes handles day-care for neighbors; has a large extended family living nearby and spends time on home improvement, country crafts and collecting dolls. Adrian – he is 25, a computer consultant who shares an apartment with two roommates. He enjoys socializing with friends, skiing, mountain biking and Internet surfing. Rosa goes on to accurately speculate that the introduction of the famous blue-green plastic iMac played a huge roll in the influence of the design for this car. I know we mention it a lot, but if Apple made a car in 2000, I’d wager this Saturn would be it. Apparently Saturn never intended to produce such a logical, practical, innovative car. But that’s a shame, because most of this vehicle’s features would impress us as a concept today, 16 years later. We need more color coordination in the auto industry. A two-way split folding doors. And split tailgates. Maybe not any more GM brands.